The beach at Rincón de Guayabitos will host 32 of the top doubles teams in Mexico; entrance is free for the general public. Rincón de Guayabitos will host the fourth edition of the Mexican Beach Volleyball Tour from January 22-24, 2016; among the players is Nayarit native Juan Virgen and Rodolfo Ontiveros from Sinaloa, the world-class doubles team that’s already in line to represent Mexico in the 2016 Rio de Janeiro Olympics. 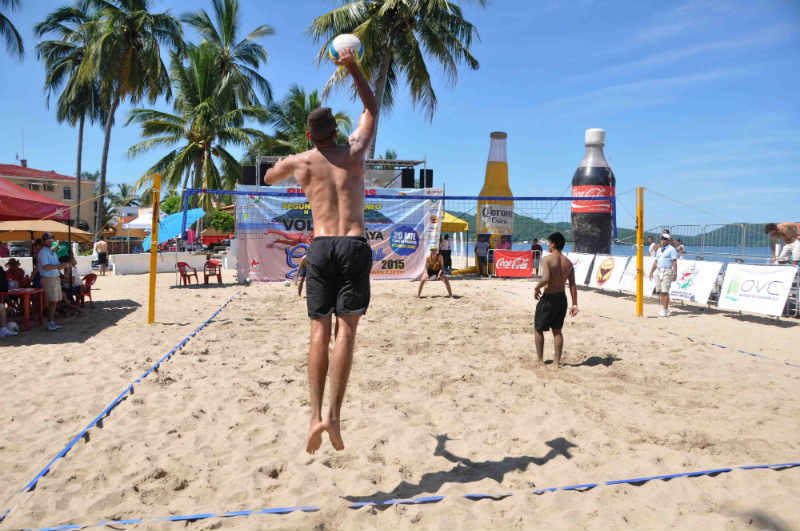 The top 32 Men’s and Women’s categories doubles teams in the country will be seeking volleyball glory at the beach in Rincón de Guayabitos (next to the breakwater). The winnings total 60 thousand pesos. Entrance is free to the general public and activities will begin at 8:30 a.m. sharp local time. This event has the backing of all three levels of government as well as the Comisión Nacional de Cultura Física y Deporte (CONADE), the Nayarit State Government and the Municipality of Compostela. The Riviera Nayarit and Rincón de Guayabitos convention and visitors’ bureaus and the Hotel and Motel Association all back the tournament, and it also received the endorsement of the Mexican Volleyball Federation. The participation of these entities and other sponsors is essential for the success of this national competition.